The UG-CICE is an unstructured-grid, finite-volume sea ice model converted from the Community Ice Code (CICE) under the FVCOM framework. The governing equations were discretized with flux forms over control volumes in the computational domain configured with non-overlapped triangular meshes in the horizontal and solved using a second‐order accurate finite‐volume solver. UG-CICE was the sea ice module of AO-FVCOM and has been used to simulate the Arctic ices and study the ice‐ocean interaction dynamics that frequently occur over complex irregular coastal geometries and steep bottom slopes. UG‐CICE was first validated for three benchmark test problems to ensure its capability of repeating the ice dynamics features found in CICE and then for sea ice simulation in the Arctic Ocean under climatologic forcing conditions and under a realistic forcing condition for the period of 1978-2013 (Figure 1). The model‐data comparison results demonstrate that UG‐CICE is robust enough to simulate the seasonal variability of the sea ice concentration, ice coverage, and ice drifting in the Arctic Ocean and adjacent coastal regions. 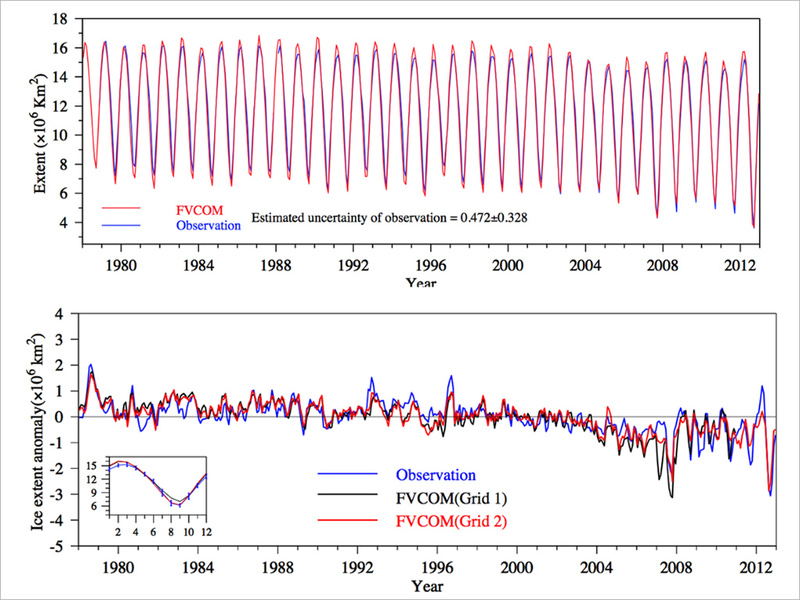 Figure 1: Comparison of model-simulated and observed ice extents in the Arctic Ocean from 1978-2013. Click the image to view a full time image. An animation of monthly averaged model-simulated and observed ice extents in the Arctic Ocean from 1978 to 2013. Animation of the ice development at the marginal ice zone (MIZ) over the shelf in the Beaufort Sea.